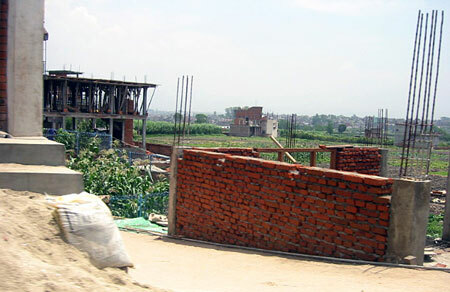 The phenomenon of Incremental Development of housing has an interesting development in Kathmandu valley. In the past (until the 50’s), when construction was limited to brick walls in mud mortar and the building had to be topped with a sloping roof of tiles to prevent monsoon seepage, the preferred house type was the single and double bay three-story construction with a sloping roof of tiles (or sometimes thatch) and CGI sheets. As land was more readily available, extension took place horizontally as complete wings were added to the original house. This was done largely to accommodate expanding extended families. This form also allowed for the creation of a variety of open spaces (forecourts, subcourts, courtyards) around the house in a neighborhood as new wings were added to existing bocks, and used for a variety of activities. In the fifties, with the introduction of reinforced concrete construction (RCC), as the residential type changed to a single bungalow, the initial construction was a one-floor building with subsequent addition of floor by floor. The “water proof” RCC roof allowed vertical expansion of the house. While larger houses were single-family houses, many later houses had separate units on each floor. This created a respectable amount of rental housing in the city. As the land prices increased, the RCC frame construction on smaller plots allowed for additional floors, thus increasing density rapidly and decreasing frontages for windows. Open spaces around the building decreased dramatically leading to many slum-like situations. The new evolving landscape was marked by the reinforcement steel bars protruding form the top slab of buildings, in anticipation of future additions. In the past decade, with the astronomical rise in land prices within the city limits, there is a tendency to build complete structures (four to five floors) in one phase as the large investment has already gone into the land. However, incremental construction continues in fringe areas of the valley where land is still relatively cheap, with no infrastructure except a vehicular track. 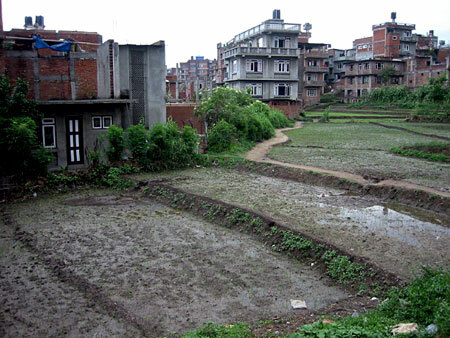 Independent houses are often seen dotting large agricultural landscapes in the valley. In most of these developments the only infrastructure is a dirt road, everything else (electricity, telephone, cable, road improvements) follows. In terms of urban structure, it is only the roads that connect with privately owned land. There is not much else. A few ‘site and services’ projects were initiated by the government beginning in the eighties to promote affordable and organized middleclass housing with basic infrastructure. These were subsequently not replicated due to upfront costs of land purchase and infrastructure that the government had to bear and the difficulty in acquiring land in the valley. In the last two decades, the preferred model for the government has been to develop ‘site and services’ projects on the land-pooling model, where developed land plots are handed back to the original owners and costs incurred are recuperated by the Government. However, these sometimes take a long time to develop because of owner speculation while the people who actually need the serviced plots to build houses cannot afford to buy the plot. With the insurgency and the political instability in the past decade, as other business dwindled, much investment was poured into land in the valley. With the result a huge number of privately developed land plotting projects mushroomed in the valley, converting huge agricultural tracts into plotted form. But these offered mainly land plots with roads and nothing else. A few organized developers in the last decade developed and sold projects consisting of a few dozen identical houses on independent lots, with better infrastructure – paved roads, drainage, electricity, water supply etc. These were all complete houses, with no consideration for expansion. But these too have now stopped due to the huge increase in land prices. Housing construction is now mainly divided into self-built units, or large-scale multi-storied apartment construction. Several squatter settlements have emerged on fringe areas and on public land, taking advantage of the fluid politics as well. The whole valley and beyond is a giant land market, where everyone whether big and small is buying and selling. The ‘site and services’ projects, promoted by the Government, are more successful in other small towns and fringe settlements of the country, mainly as resettlement projects promoted by the Government on public land or acquired land where acquisition is easier. Copyright © 2009-2010, Global Consortium for Incremental Housing. All Rights Reserved.